…well, overcast really. And a bit grubby. Not what I’d call unpleasant by any means, but the morning’s scattering of clouds had thickened as I climbed through the forest, and the skyscrapers of Brisbane’s Central Business District imposed rather than shone in a landscape which just about let me catch a glimpse of the sea to the far east. To the south, some pointy mountains were slightly too distant to look really impressive. Around me, happy Indonesian tourists made the best of the grey conditions, and took pictures of the clouds and their children with even-handed equality. The point of this – at least for the reader who enjoys those entries that tunnel through the author’s frontal lobes, rather than just describe their experiences – is that Australia’s been a bit like that overall, so far. For every tick in the Vegemite sandwich (very good) column, there’s been an equivalent smudge in the cleaning-up-dead-cockroach (not so good) one. This is more a reflection of my circumstances than of the location, admittedly; it isn’t Australia’s fault that I’m spending hours going from shop to shop with CVs like a door-to-door employment salesman. Nor do I wish to give the impression that it’s all been awful; after the terrifying initial house-hunt, everything’s settled down a lot into quite a flat sort of routine; wake and eat, walk and attend, job hunt and eat, read and sleep. I had staked a lot on the beginning of lectures to give the whole thing some degree of life, and on attending a job-hunting advice session before that, and on finding a house before that. It’s probably about time I figured out that any real change in outlook is probably going to be a bit more gradual. Nonetheless, it’s impossible to retain any optimism without looking forward a little. The remaining landmarks are the advent of tutorials next week, and the societies and clubs fair tomorrow, which might open up a bit more in the way of Aran-Aussie interaction (the latter has probably already happened by the time you read this – I’m writing these well in advance of loosing them on the world, to allow time for a good reflect and proof-read). It’s all been quite curiously lonely, so far. Which is odd, because I always had myself figured as someone who values and enjoys their own company. I haven’t changed my mind on that – I do like time in my own head, and the lack of people I know here is more of a slightly melancholy change in life-pattern than any sort of disaster. Nonetheless, it does make me miss my friends back home, and also make me envy those who had the resources to go into UQ halls, or the foresight to choose universities where the equivalent didn’t charge up-front. Additionally, it makes me thoroughly grateful for both how easy Edinburgh University made first year, with the quasi-halls arrangement at Darroch Court, and the friendly and pleasant group of guys that shared flat 9/7 with me. One of the things which has brought joy into my Australian residency is the wildlife. The suburbs between my own house and the university – a good three miles of solid walking – are lush with trees and shrubbery, almost screening the houses from view, and all this foliage constantly rustles and chirrups with all manner of strange, wonderful life. The bugs – cockroaches notwithstanding – are scary, seeing as I still exist in that nervous tourist world where I’m half-convinced that any little yellow bug might give me tuberculosis (this, I will acknowledge, is not only irrational but ill-informed), but the rest are glorious. The birds are the most obvious – crows with beady blue eyes perch on trees in almost every street, and though I have yet to sight a kookaburra their simian laugh echoes frequently through wooded areas*. Today, I was delighted to spot a tree graced with three boisterous yellow-and-white cockatoos, still dear to my childhood brain as Kiki from Enid Blyton’s Adventure series …or was it only the TV adaptation? Apart from this exotic find, my favourite birdlife is probably the bush turkeys, which everybody speaks of as annoying pests but seem like great characters. They wander all around the suburbs, Mt Coot-tha and the university campus alike, gobbling happily and scratching at the dirt with a refreshing disregard for landscape gardening. Ibises are commonplace too, and once when I was unwise enough to unveil a doughnut near the UQ lakes, I found myself surrounded completely by ibises, red-beaked swans, skinny black waterfowl, croaking crows and quacking ducks, all dancing greedily around me as I controlled them effortlessly simply by tactical distribution of doughnut crumbs. And then, the possums. I can only imagine what sort of glee my first koala or kangaroo is going to excite in me, but thus far the possums are the highlight. 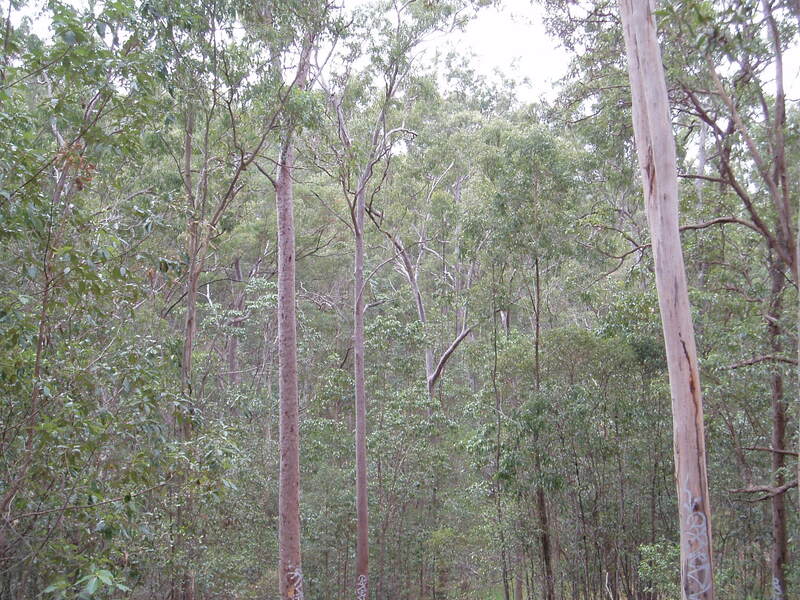 My first one was magical – I was walking home through Indooroopilly (yup!) at around half five, just about the time it gets dark in this Australian “winter”. And there, scampering not through the trees but along the telephone wire, squirrel-sized and curly-tailed, a possum appeared silhouetted against the darkening sky. It was a fantastic moment, and another came just the next evening – I was running back to the university in a panic, having left my keys at the library, when all of a sudden a rustle in the trees to my left made me halt. I looked over, and saw a possum nestled in the crook of a branch, watching me inquisitively with his intelligent little face – and then my eyes faded into focus, and I noticed that there was another one even closer to me, looking over with the same benign curiosity that I bestowed on them. As I said, these have been the best moments of my time away so far. I love the sensation that I’m walking the world as part of one species among many, not the sole remaining wild beast on an otherwise barren plain. It’s nice to leave off typing on a positive note, and besides, mundane experiences make for mundane reading. So I’ll sign this one off here, with the image of four twinkly eyes staring back at me out the Australian twilight. With any luck, I’ll get to see some more before long. 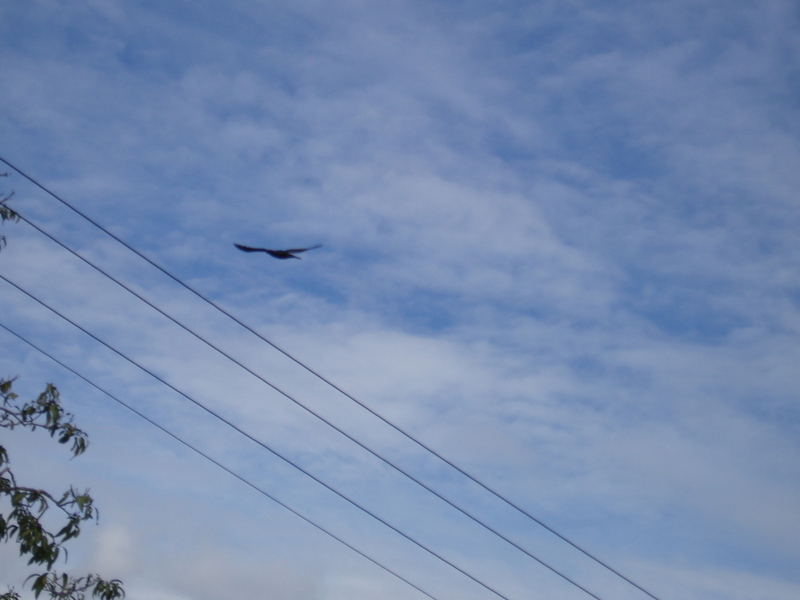 A crow flees the camera. Three cockatoos, just about visible in a tree. The one on the top left is easiest to spot. * In conclusive proof that copy ain’t no good if it ain’t hot off the presses, both asterisked points have changed for the better since I drafted this. 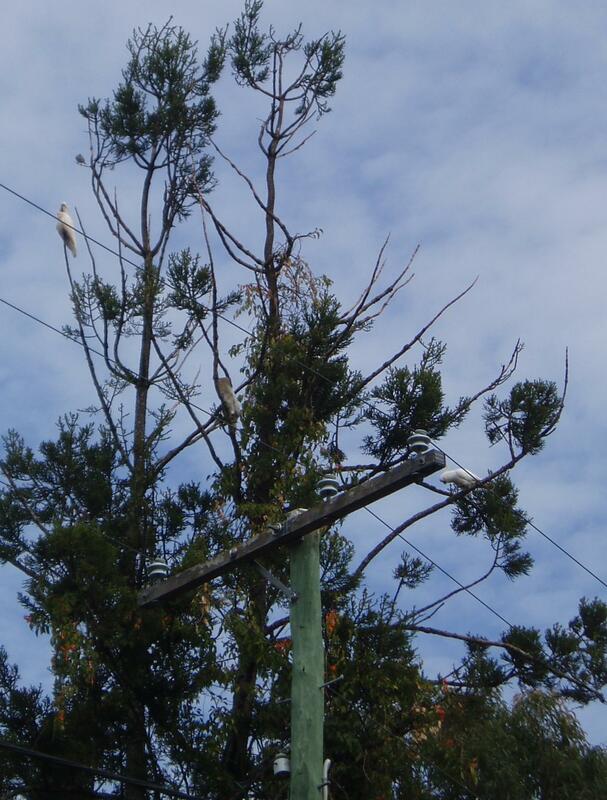 A rainy day brought the kookaburras – cackling like demonic monkeys – out to the telegraph poles in force. Meanwhile today featured almost a surfeit of good conversation from some genuinely lovely folk called Morgan and Emil, who comfortably carry off the prize for most-awesome-people-met-in-Australia-so-far. Aw, you’re so sweet. :P Although you still failed to text me back about seeing Inception, and you DEFINITELY MISSED OUT. P.S. Have you seen a bat yet? They have bats here!